In today’s surface finishing industry, electroless nickel stands out as a coating that has evolved through many generations. Within the last 25 years the costing demand has created an increase in opportunities and challenges for suppliers continuously improving the product corrosion resistance, brightness, hardness, adhesion, plating rate, bath stability, and bath life. Within the last 10 years the challenges have not only included product attributes, bath stability, and process improvements. The environmental directives have introduced a new set of challenges for the industry to address. The new environmental challenges include; RoHS, “Restriction of Hazardous Substances”, ELV Annex II “European End of Life Vehicle Directive”, and WEEE “Waste Electrical and Electronic Equipment”. These directives restrict the maximum concentration of lead, cadmium, mercury, hexavalent chrome, polybrominated biphenyl, and polybrominated diphenyl within the coating deposit and promotes recycling and recovery of electronic components that are considered hazardous waste. Lead and cadmium have been the standard components in the electroless nickel formulation to enhance deposition brightness and bath stability. Although the majority of today’s electroless nickel products meet the maximum requirements of lead (maximum 0.1 wt %) and cadmium (maximum 0.01 wt %) the trend is moving towards the complete elimination from both in the deposit. Based on this continued trend, the need for an electroless nickel that is lead and cadmium free with equivalent or better properties, and bath stability is apparent. 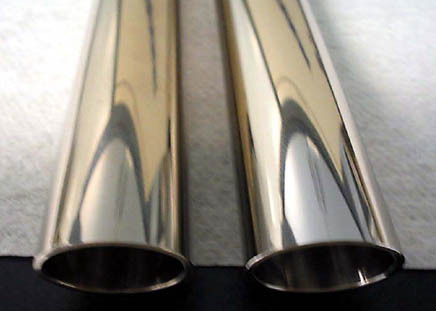 Lead and cadmium-free electroless nickel systems are commercially available. The shortcomings to the initial systems have been addressed and additional product attributes have come forth. Magnetic properties: Slightly ferromagnetic to nonmagnetic as plated. Increasing ferromagnetic properties approaching pure nickel with heat treatments. Electrical resistivity: 40 – 80 micro-ohm/cm/cm2 as plated. Contact resistance increases with plated age and thin layer oxide development common to nickel alloys. Micro-hardness: 550 – 600 Vickers (100g load) as plated 950 – 1050 Vickers (100g load) after suitable nickel phosphide crystallization. Corrosion resistance: Concentrated nitric acid – fails 30 second test. Neutral salt spray (per ASTM 117 B) – 100+ Hrs. Adhesion: Passes round mandrel bend test on steel, copper, and aluminum alloys. The luminous intensity displayed as Gs(20o) is a percent index to standard sample as shown by the next formula, then it can be over 100 if the measurement sample is brighter than the standard sample. Certainly, the larger the values for Gs(20o) the brighter the sample. In our experience, if the value of Gs(20o) differs by over 20 between two samples, the difference of brightness between two samples can generally be seen by the naked eye. Deposit thickness of measuring samples is unified to 10μm in this paper because Gs (20°) is greatly influenced by plated thickness as mentioned later. The Gs (20°) of deposits from a lead and cadmium free electroless nickel system was compared with two types of typical proprietary electroless nickel phosphorus processes in figure 2. Both proprietary processes are medium-phosphorus type containing a lead compound as stabilizer. One of the typical processes contains sulfur compounds while the other does not. The Gs (20°) of the Pb/Cd free deposit is vastly superior when comparing these three baths, and Gs (20°) of the two typical proprietary baths are of the same level despite the sulfur compounds. This difference of brightness level was easily observable. Correlation between Gs (20o) and MTO is indicated in figure 3, and correlation between deposition rate and MTO is indicated in figure 4 for reference. The deposition rate is gradually decreased with bath aging by the increase of complexing agents, but Gs (20o) is minimally changed. Gs (20o) of thin deposits is influenced very much by the surface morphology and polishing state of the substrate. 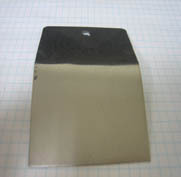 The Gs (20o) on Al substrates for hard drive disk (HD) having a smooth surface is higher than that on a dull Fe substrate having a rough surface as shown in figure 3. The chart in figure 7 is a brightness comparison between a lead and cadmium free process and other proprietary electroness nickel systems with and without the sulfur compound. Salt spray (Fog) testing was performed on samples plated on aluminum (figures 13) and steel, (figures 14) plated with a lead and cadmium free system formulation, also on samples plated on aluminum using a standard Pb and Cd bath (figure 15). The test was run for 96 hours in a chamber with solution specifications called out in ASTM B 117. 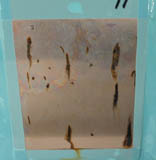 The samples were plated at 1 mil nickel thickness on all samples. The test results produced equivalent corrosion to the lead and cadmium systems. Plating electroless nickel on aluminum has been problematic and costly due to short bath life. 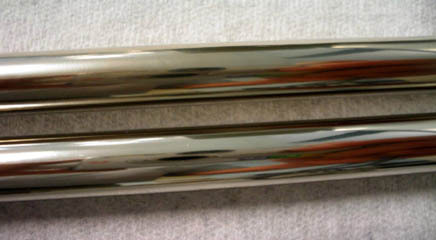 The typical lead and cadmium systems can plate steel for six to eight MTO’s (36-48 g/L nickel plated). Plating on aluminum reduces that bath life by about 50%. 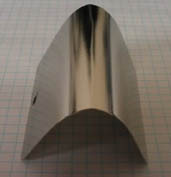 The primary failure is poor adhesion of nickel to the aluminum, resulting in blisters or nickel peel when the aluminum is bent. The technology developed to addresses this problem of short bath life included an alkaline nickel strike after zincating and prior to the electroless nickel bath. Drawbacks to that approach include extra tanks, process steps, and control of an additional plating bath. 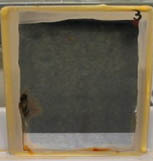 Although this technology development has proven to be adequate, failures have been reported with nickel-to-nickel adhesion. A further application-specific problem is that the alkaline strike baths always deposit magnetic nickel, thereby limiting their use to applications where magnetism is a factor. Lead and cadmium free systems provide excellent aluminum adhesion through at least six MTO’s. The process does not require the alkaline nickel strike after the zincating and prior to the electroless nickel bath. Processes add no additional steps compared to the typical aluminum preparation double zincating, eliminating the possibility of nickel-to-nickel adhesion issues. Pre-cleaning of aluminum process employed for Pb and Cd free electroless nickel. Important new technology breakthroughs include lead and cadmium free electroless nickel products in concert with proprietary cleaning, etching, and zincating technologies. Stay ahead of the environmental directives and requirements with the latest in electroless nickel technology.